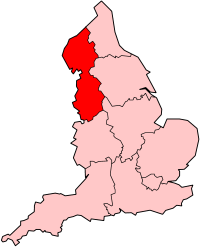 The Crewe to Manchester Line is a railway line in north west England, running from Crewe north east to Manchester. The line was built by the Manchester and Birmingham Railway Company, which diverted to Crewe in 1841 and merged in 1846 with others to form the London and North Western Railway Company, which in turn became part of the London Midland and Scottish Railway in 1923. The line from Crewe to Manchester Piccadilly (including the Styal line) was the first section of the West Coast Main Line to be electrified, in 1959. The line was recently upgraded as part of the West Coast Main Line upgrade. A full service resumed on the line in March 2007. The line is joined at Cheadle Hulme by the WCML line from London via Stoke-on-Trent and at Stockport by the Mid-Cheshire Line from Chester and by the Hope Valley Line from Sheffield joined with the Manchester to Buxton Line. In April 2006, Network Rail organised its maintenance and train control operations into "26 Routes" and the Crewe to Manchester line was included in Route 20 (North West Urban). Services on the line are provided by Northern Rail, which operates trains between Crewe/Alderley Edge and Manchester Piccadilly via Stockport and the Styal Line to Manchester Piccadilly via Manchester Airport. A number of the Crewe /Alderley Edge - Piccadilly services also extend beyond Piccadilly to terminate at Manchester Oxford Road. Also a number of services to/from Manchester start or terminate at Wilmslow. Arriva Trains Wales operate a through express service between Milford Haven and Cardiff via the Welsh Marches Line - Manchester. Virgin Trains operate West Coast Main Line services between London Euston/Birmingham New Street/Crewe - Manchester. CrossCountry also operate a small number of services on the line between Manchester Piccadilly, Birmingham New Street and the South. The maximum speed of the line is 110mph. Wikimedia Commons has media related to Crewe to Manchester Line.